A brave new, challenging world? New technologies open up opportunities to improve the quality of life along with the inevitable ethical pitfalls. Organ transplantation is one such promising avenue with the flip side: Is the organ freely given? Has the receiver applied coercion or inducement? Can countries collaborate effectively to prevent the gift from becoming a trade? These and other vital questions arising from the complex web of social, religious, cultural and legal issues involved are discussed in our special theme section on the deceased organ donation programme in six countries, by authors committed to ethical practice in the field. Their explorations of some perennial ethical challenges coordinated by our guest editors, Aamir Jafarey and Sanjay Nagral, will be of value to us all. The sharing and exchange of ideas in animated, even heated debate, is the life’s breath of advances in knowledge. This issue continues the ethical debate on a controversial subject—the use of a no-treatment or no-test arm in clinical trials. Can this be called legitimate experiment by dedicated researchers seeking an elusive cure? Is it ethically justified? The jury is still out on this, and more discussion is clearly called for. Responses are flying in and we invite readers to contribute their valuable insights in the field. An author raises the issue of a noted scientist associated with a notorious clinical trial. A study analyses the challenges in India to the effective functioning of ethics committees; and another examines whether the necessary weightage is given to ethics education in public health curricula. The enthusiastic response the journal is receiving has inevitably meant serious space constraints. We have had to drop some of our regular features in this issue; but we are hopeful that the content of the issue will compensate for that. Cover credit: The painting entitled “Zagor” is reproduced courtesy of the artist, Bernadette Gomes, and depicts a cultural tradition of Goa. Organ donation in the Philippines: should the dead do more? 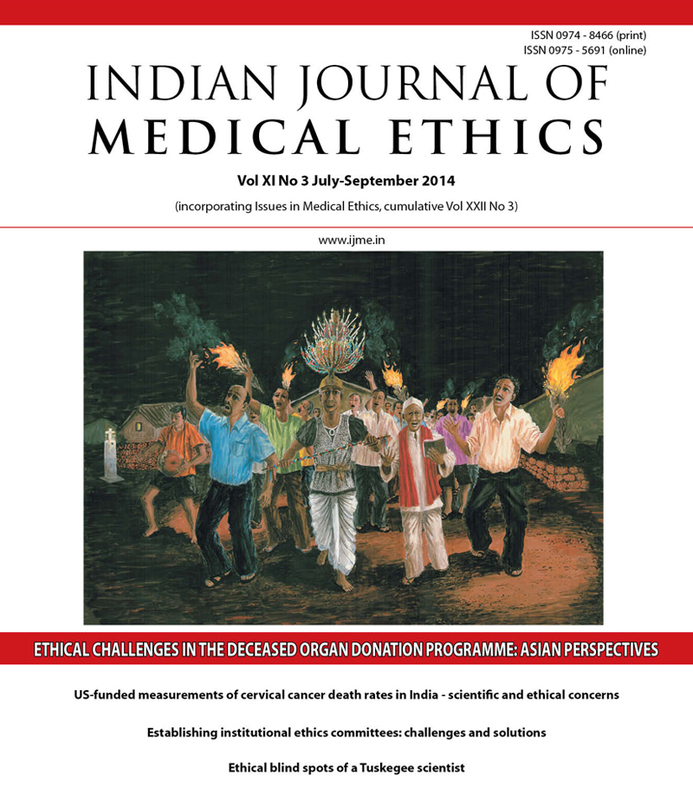 Deceased organ donation in India: where do we go from here?